For use with long tube headers. ON TRACK / OFF ROAD USE ONLY!! 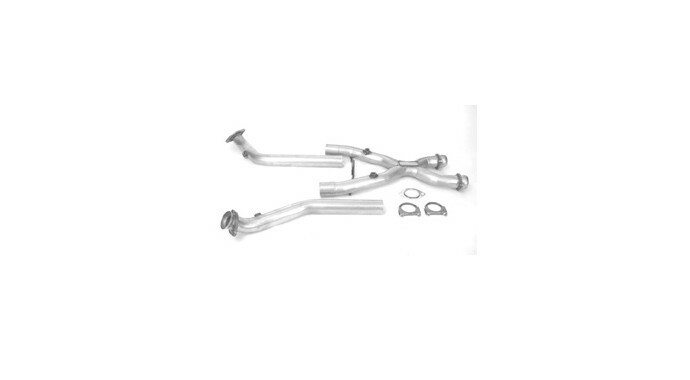 Stock Manifold connect off-road X & Y pipe kits replace the stock catalytic converter pipe assembly. Bolt direclty to the stock manifold. Oxygen sensor simulators may be required. Most kits include the clamps necessary to complete the installation. NOT EMISSION LEGAL FOR VEHICLES DRIVEN ON THE STREET. 2004 Ford Mustang Cobra 4.6 Liter V8 - DOHC, Manual Trans. 2003-1999 Ford Mustang GT 4.6 Liter V8 - Manual Trans.